...but I managed to find some time for a quickie post. I got this Stefanel bangle yesterday. 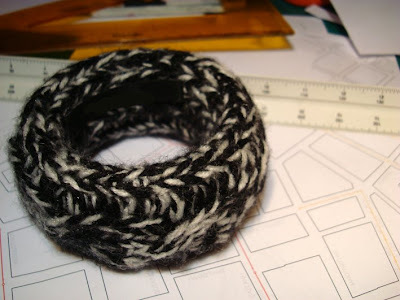 The chunky knit keeps my wrist warm and its cuteness lifts my spirits while studying. I wish I could show you a picture of my new find incorporated in an outfit, but I guess you'll have to wait a few more days for that. Ok, that's all for now. Back to studying. cute bangle! come back soon though. i am missing your cuteness already! very avant - garde bangle I dare say! looks like something you could have made yourself! Miss you, dollface. Good luck with all the studying mayhem. Aw, that is adorable! Great to see you posting! Knowing that I am not the only one who is studying endlessly makes me feel so much better! Love that bracelet, it's very unique! Very fun. 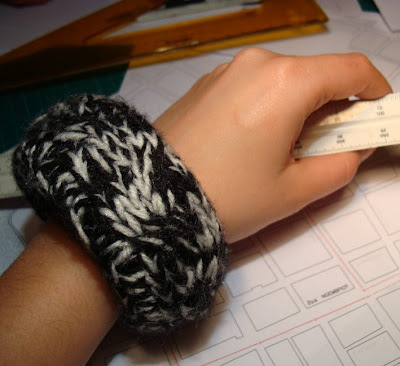 I like the use of unusual material for an accessory. I really like the bangle. Would love to see how you work it into an outfit. hope all is well with you & u'll be with us soon!